The fund aims to provide a high level of income by investing in investment grade corporate credit with a focus on capital preservation and enhanced returns. 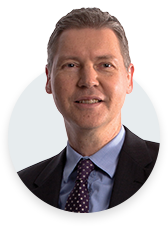 Watch portfolio manager, Simon Howie, review the current positioning and outlook for the Investec High Income Fund. The Fund has outperformed the STeFI Composite 57% of the time since inception and by 86% since its benchmark changed to the STeFI Composite on 1 July 2011. 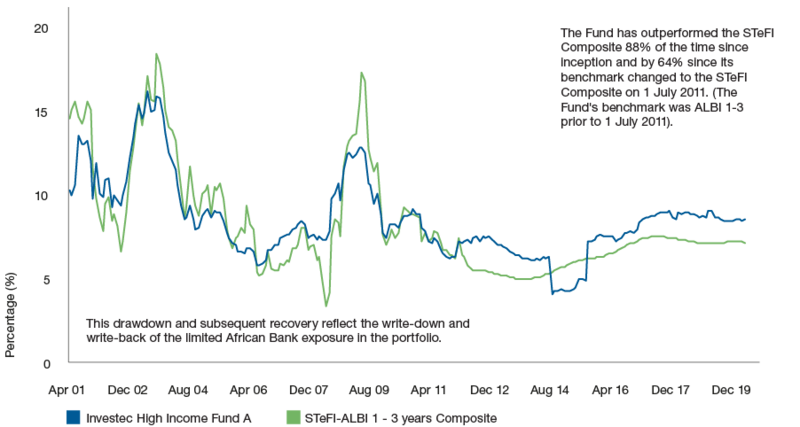 (The Fund's benchmark was ALBI 1-3 prior to 1 July 2011). Source: Morningstar and Investec Asset Management, since inception of the Fund’s A class on 02.04.00 to 31.12.18. Performance figures are based on a lump sum investment, NAV-NAV, net of fees, gross income reinvested, in ZAR. Highest and lowest 12-month rolling performance since inception* is 16.1% (30.06.03) and 4.3% (31.08.14) respectively. All information is as at 31.12.18 unless stated otherwise. All information provided is product related, and is not intended to address the circumstances of any particular individual or entity. We are not acting and do not purport to act in any way as an advisor or in a fiduciary capacity. No one should act upon such information without appropriate professional advice after a thorough examination of a particular situation. This is not a recommendation to buy, sell or hold any particular security. Collective investment scheme funds are generally medium to long-term investments and the manager, Investec Fund Managers SA (RF) (Pty) Ltd, gives no guarantee with respect to the capital or the return of the fund. Past performance is not necessarily a guide to future performance. The value of participatory interests (units) may go down as well as up. Funds are traded at ruling prices and can engage in borrowing and scrip lending. The fund may borrow up to 10% of its market value to bridge insufficient liquidity. A schedule of charges, fees and advisor fees is available on request from the Manager which is registered under the Collective Investment Schemes Control Act. Additional advisor fees may be paid and if so, are subject to the relevant FAIS disclosure requirements. Performance shown is that of the fund and individual investor performance may differ as a result of initial fees, actual investment date, date of any subsequent reinvestment and any dividend withholding tax. There are different fee classes of units on the fund and the information presented is for the most expensive class. Fluctuations or movements in exchange rates may cause the value of underlying international investments to go up or down. Where the fund invests in the units of foreign collective investment schemes, these may levy additional charges which are included in the relevant Total Expense Ratio (TER). A higher TER does not necessarily imply a poor return, nor does a low TER imply a good return. The ratio does not include transaction costs. The current TER cannot be regarded as an indication of the future TERs. Additional information on the funds may be obtained, free of charge, at www.investecassetmanagement.com. The Manager, PO Box 1655, Cape Town, 8000, Tel: 0860 500 100. 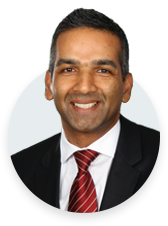 The scheme trustee is FirstRand Bank Limited, PO Box 7713, Johannesburg, 2000, Tel: (011) 282 1808. Investec Asset Management (Pty) Ltd (“Investec”) is an authorised financial services provider and a member of the Association for Savings and Investment SA (ASISA).